Fluoropolymer Films Market size was over USD 1.5 billion, with projected gains close to 5% CAGR between 2016 and 2024. 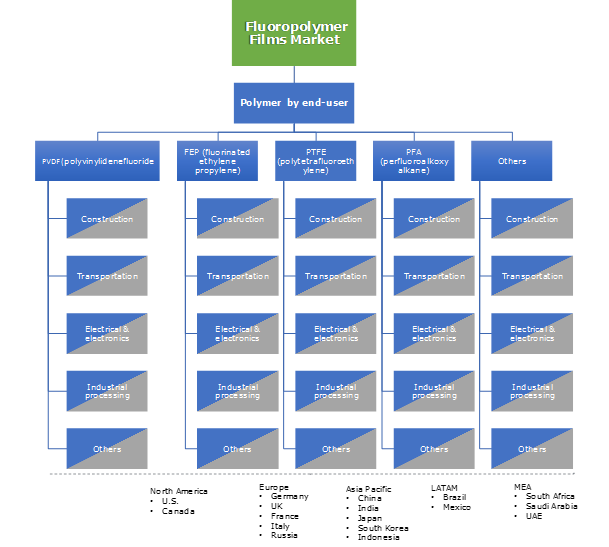 Fluoropolymer films market is projected to generate revenue over USD 2 billion by 2024. The industry is expected to have robust demand from the end-user sectors including: construction, transportation, electrical & electronics, industrial processing, etc. The unique features including: chemical inertness, lower coefficient of friction, weather and UV resistance, negligible moisture absorption, remarkable dielectric properties, robust optical properties and uniform performance throughout the temperature extremes will fuel the fluorine-based organic polymer film market size by 2024. Rising popularity for the product as a substitute for glass in photovoltaic (PV) modules will drive the fluoropolymer films market in the near future. Until 2016, less than 2% of global electricity was generated from solar photovoltaics. As per the estimation by the International Renewable Energy Agency (IRENA), by 2030, solar energy will hold the potential to power 13% of the world. This depicts huge potential for the fluorine-based organic polymer film market growth over the forecast timeframe. Solar power has been displacing coal and various other sources of energy in the recent decade. The cost of electricity from solar PV was about 1/4th of the same in 2009 and will likely fall tremendously by 2040. Comprehending the significance of solar energy, various economies have undertaken the solar capacity increments in 2016. For instance, major capacity increments were recorded by the U.S. (14.7 GW), China (34.5 GW) and Japan (8.6 GW). Such traits of solar capacity increment along with decreasing cost of solar PV will propel the overall demand for fluorine-based organic polymer film by 2024. Fluorine-based organic polymer films will also witness significant demand in the pharmaceutical applications by 2024. The sector has been observing trends such as: next-generation drug containers as well as the drug delivery systems such as stoppers, cap liners and plunger laminates. Apart from these areas of usage, fluorine-based organic polymer film are likely to hold scope as release films in the cryogenic sample bags, skin- and mounted devices in the coming years. Industry participants have innovated high-cost technologies for fluoropolymer films, which involved complex manufacturing process. 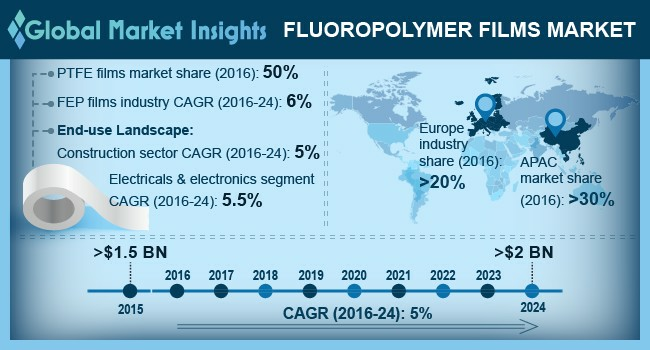 High costs of the raw materials-fluoropolymers might restrain the industry growth to some extent. Moreover, the manufacturing technologies have been patented and are difficult to be adopted by the new entrants. Thus, industry participation by new players is likely to be low by 2024. PTFE (polytetrafluoroethylene) films held the highest share close to 50% in global fluoropolymer films market in 2016. PTFE films will witness significant growth in the coming years for their applications in chemical processing, electrical & electronics and other end-user industries. The demand will be attributed to low price of PTFE films along with their unique characteristics such as: good electrical insulation, high-temperature resistance, chemically inertness and low coefficient of friction. FEP (fluorinated ethylene propylene) are projected to witness strong growth close to 6% CAGR over the forecast timespan. Rising demand for FEP films usage as a substitute for glass in the frontsheet of photovoltaic modules will propel the market size. For instance, frontsheet made of Teflon FEP film by The Chemours Company (divested from DuPont), when coated on a typical 1600 mm X 800 mm PV module, weighs less than 150 grams. The corresponding glass frontsheet could weigh more than 10 kg. Construction segment held significant share in global fluorine-based organic polymer film market in 2016 and is likely to grow with CAGR close to 5%. fluorine-based organic polymer film have been recognized for their applicability in various construction applications such as: water-repellent architectural fabrics, anti-graffiti coverings, fiberglass composite for structures, protection against extreme corrosion, fading, cracking, etc. The product demand will be attributed to their unique characteristics such as: flame retardancy, weatherability, thermal stability, etc. Construction sector will feature significant opportunities for fluoropolymers films in the wake of modernization of architectural practices by 2024. Electrical & electronics segment is expected to be the fastest growing segment with growth close to 5.5% CAGR by 2016. fluorine-based organic polymer film will observe strong demand for applications in this area, for instance, electrical insulation, wire & cable coatings, in photovoltaic modules etc. Asia Pacific held the highest share above 30% in global fluoropolymer films market in 2016. The region is expected to witness fastest growth by 2024. The massive share over 50% in the region was contributed by China in 2024, for the vast availability raw materials. India is projected to witness the fastest growth in the region in the next 7 years. By 2025, India's construction market is probable to emerge as the third biggest across the globe, with strong prospects for the product in robust infrastructural development. With 1.3 billion population, India was world’s third largest consumer of electricity in 2016. Indian government has been engaged in various initiatives aiming at 24x7 electricity by 2030, The nation has been working on solar parks in association with The World Bank, which will drive the demand for fluoropolymer films in solar photovoltaic coatings. Significant market players include: The Chemours Company, DUNMORE Corp., DAIKIN Industries Ltd, Polyflon Technology Ltd., Saint-Gobain S.A., The 3M Company, Asahi Glass Co., SKC Corporation, Kureha Corporation, etc. Global fluoropolymer films market was highly price competitive in 2016 with strong traits of backward integration. The foremost industry players are also engaged in production of fluoropolymers and hold a more flexibility in end product prices & discounts. Fluoropolymer films are manufactured from the fluoropolymers, which are the polymer materials containing fluorine atoms in their chemical structures. On account of the low susceptibility to Van Der Waals force, these films exhibit friction reducing and non-stick features. They contain multiple strong carbon–fluorine bonds, featuring unique non-adhesive and low friction properties. The films feature superior electrical properties and superior resistance to heat, chemical, weather as compared with the other polymers. Drifting focus towards the usage of high performance resins will lead to strong prospects for the fluorine-based organic polymer film.